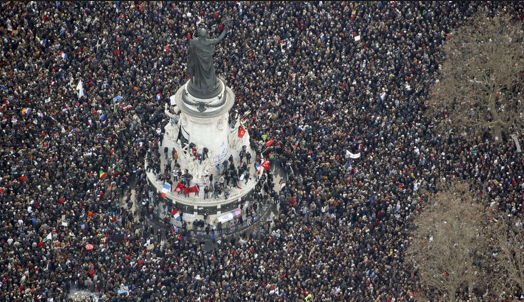 Who could not have been moved by last Sunday's manif in Paris, the rare show of solidarity from world leaders, the grief of the diverse crowd? While watching, my e-mail pinged with messages from friends: a Jew, a several atheists, a Protestant minister, a Muslim. How grateful I am that we are in touch. I also sought articles, posts, press coverage, trying not to read only the views that echoed my own, which is not easy. One of the most insightful pieces was Andres O'Hehir's "Why the Charlie Hebo attack goes far beyond religion and free speech", posted on Salon. And I wondered, as I do during each soul-shattering event like this, What can the average person do, now? One word keeps coming back: connect. By that I mean the lunches and dinners I've had (and should do more of) with colleagues and friends from diverse backgrounds, times when we've taken maybe longer than we should have during the work day, or stretched dinner into the late evening as we explored the bases of our beliefs, told our life stories. Even those from historically conflict-ridden histories have found new respect for one another. I mean the courses and workshops that have led me out of comfortable affinity groups and unconscious stereotypes; the on-the-fly talks with neighbours and the owner of a local hole-in-the-wall. Pick-up softball, community green alleys, interfaith retreats, family camps: you name it, as long as the people who show up are not one homogeneous chunk. There are other opportunities out there for the taking, and I hope to do more of that. Extremists don't show up to those kinds of gatherings and I've no illusions about the odds of open communication once someone chooses the tactics of terror. The solution to that level of brutality is not in my sights. But it is vitally important to engage with just regular folks, for we are the vast majority. Until we begin to talk to one another, how can we live in harmony? I am always looking for small steps that build bridges toward what I have observed that vast majority of people of all faiths (and none) want: peace. My best friend, I have known her since I was eleven, converted to islam and is the 2nd wife of a "sheik" (he has 3). We are still very close, I have attended some of their gatherings and prayers and met many charming and interesting people through her. Is that "normal" it is certainly different. For me diversity is the spice of life. It is by stepping out of our affinity groups and by learning about others' beliefs that we connect. I don't understand terrorism but it must grow among the marginalized and the poor. How does a country put an end to the recruitment of young people to kill and to be killed? I want to believe that education and food will help but I might be naive. What a thoughtful and wise response, K. And it's practical as well. This is something we can do, even if we might have to step out of our usual patterns. These kinds of connections are especially important in view of the danger of a reactionary movement gaining ground as a response. If all countries could focus on providing education and opportunities for all of their citizens, I think it would go a long way towards curtailing the problem. I feel that the clerics in the Muslim faith, should vocally, and vociferously, renounce this type of behavior every time it occurs. I believe most Muslim countries have renounced this, yet I have not heard this in one broadcast by our media. I had to search for this on the internet because I could not believe that they condoned this behavior. Extremism, in the name of any religion, should never be tolerated. It is up to the heads of any religious organization to make sure that the message gets out to the population of the world, that they, and their religion, will not tolerate terrorism in the name of their religions, no matter what faith is involved. By not doing this, it exacerbates the problem. Lovely post, as usual. My thoughts on this issue have been around the topic of 'grace'. I am of the priviledged majority in my country and have the right and ability to do and say all sorts of things that wouldn't be gracious. I believe in the Christian ideal of being humble and thinking of others as better than ourselves. (I admit I've got a long way to go towards putting it into practice, but that's what I aspire to). I would like to think that I'm on the side of minorities, oppressed people, poor people and that I use my vote and my voice and some donations to try and help. Yes, its important to reach out and be willing to understand other people. I feel sad when I read a lot of the self-serving commentary in parts of the press. My first husband was a Muslim (from SE Asia). We met in Canberra, married and moved to his country because his career was there and after a long period of study he longed to see his family. I couldn't have been made more welcome by his family who were so loving and kind to me. Although the marriage didn't last and I eventually returned to Australia, I still think of him and his family with immense fondness and respect. They taught me so much about true love and kindness; I agree with you that it is very important to try to break down barriers of culture, language and religion by making friendships at best and fostering good will at the least. Easier said than done perhaps? Thank you for your thoughtful and encouraging words. I also believe that it is the small steps we take to maintain connections that will ultimately make the difference in how we live together. On moving from an academic workplace in a city to a rural farming village, I was struck immediately by the almost complete lack of racial and cultural diversity. And I miss that. A lot. Sadly, most often when I read outside my sphere of opinion, I find so much ranting and raving. It's hard to find thoughtful and kindly conservatives in America, at least those that speak out:(. I know they exist, but the mass media doesn't value those who speak in reasonable tones. Thoughtful and well-stated post. I think that conversation and relationship is the most important thing, and it is up to each of us to reach out to others around us. Unfortunately we seem to live in a world where media glorifies those who rant and rave. We must learn to let it slide by us, to not let the lunatics intimidate us into despair, and continue to reach out. One touching story about heroism and living in harmony: Lassana Bathily, the young Muslim man from Mali who worked at the kosher supermarket and saved several shoppers there. He will receive his citizenship papers, and many are calling for him to get a Legion of Honour for his bravery and quick thinking. He said he never had any problem working with the Jewish store management, as a practising Muslim; they all got along and the managers let him say his prayers.